Have you had pumpkin jam before? You should, believe me. When I had a huge pumpkin to dissect and prepare few weeks ago, then pumpkin jam was one of the items on my to-try-list. And as we've already eaten most of the jam I made, I'm going to make some more tomorrow. The jam has a beautiful bright yellow colour, and lovely ginger kick. We love it. We had this on pancakes this morning, but it's also great spread of a slice of toast, or served as a condiment with some grilled meat (especially if you go heavy-handed with ginger). Wash the lemon, pat dry and grate the zest. Remove the white pith and discard. Cut the lemon flesh into smaller pieces. Place pumpkin, water, lemon flesh and grated ginger into a heavy-bottomed saucepan and cook on a low heat, covered, until the pumpkin flesh is softened. Remove the lid for the last 5 to 10 minutes, so the extra moisture could evaporate. Smash the pumpkin flesh with a wooden spoon until broken (or press through a fine sieve, if you want a very smooth jam). Add the jam sugar and grated lemon zest, and cook for another 10 minutes. Spoon the hot jam into sterilised jars and close immediately. Pille, this is just wonderful, I MUST make it! Great colour and I'm sure I will love the taste too! Thanks baby! Oh yes Pille! I especially like it's using the lemon flesh, that would tend to thicken it I would think! I've never tried pumpkin jam before, great idea! This is now a must try on my fall cooking list. Thanks! Beautiful!!! I can't wait to try it. There's a Polish food blog event featuring pumpkin recipes next week, can I use your recipe for it? And, did you mean 200 ml of water, or sugar? This looks beautiful Pille. What an interesting combination for a jam. I'm keen to try out - just wanted to clarify how much water you add to the pumpkin and lemon? This looks delicious, and just in time for Thanksgiving. Thanks. Never had pumpkin jam, but it sounds very intriguing, Pille. I will definitely give this recipe a try. Yum! I can't believe I've never had pumpkin jam. I will be making this asap! I would love to include your recipe in our pre-loaded Demy, the first and only digital recipe reader. Please email haleyglasco@gmail.com if you're interested. It looks gorgeous! Do you know if it can be preserved? I mean, does it need to be refrigerated immediately? Or does it store? Thanks! Oooh, I've never had pumpkin jam but I'm sure I'd love it. Glorious colour too! superb .. love the subtle gingery taste . 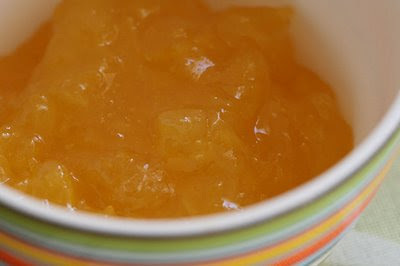 i didnt have jam sugar so used half a cup pure apple juice to provide the pectin .. looks and tastes great. It was easy to make and came out delicious. 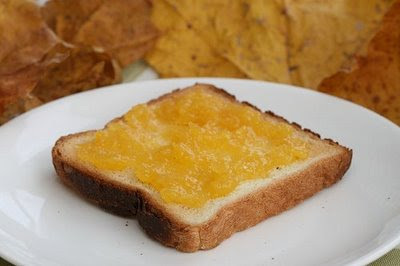 What I particularly like about it, is that the jam isn't too sweet and has a lovely slightly spicy ginger flavor which goes perfectly with the mild pumpkin taste.